SniperSpy is remote computer monitoring software that can be installed onto your child’s PC either directly or remotely. This monitoring software is ideal for parents who spend a good amount of time at work while their kids are home, or just to become more familiar with what kids are doing on the computer when you’re not watching. Do you suspect your kids are using the computer improperly, and are accessing inappropriate content? Do you wonder if your kids are safe while surfing the internet, and are not prey to online predators? If so, the SniperSpy is just for you. With its many logging and LIVE monitoring features, you’ll feel as if there is a surveillance camera pointed right at them when you’re away. Remotely and locally deployable, you will receive an instant download after purchase and will be ready for monitoring in no time. Recorded logs uploaded to a secure online account can be viewed from anywhere. Simply login to the account from any computer, tablet, smartphone or other device with internet access using the user created username/password. Take a look at this short video to see how it works. 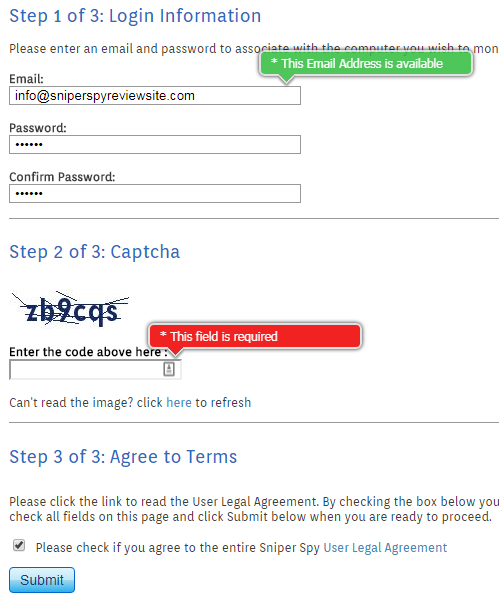 On top of the great quality monitoring software you get with SniperSpy, you also get first rate service. If you ever run into any issues with this software, they offer online knowledge base support, email support, and even offer toll-free telephone support. After purchasing this software, you will instantly receive an email containing 1) a Registration Code and 2) a link to download the module creator program. Before creating a module, first register an account with a user name and password. To register, go to the Create Account page, enter your email and password and create an account. After creating an account, you need to create the module. This will be used later to send to the remote computer as an email attachment or it can be executed locally onto the computer to be monitored. To create a module, open your order email, click on the link and install the program. To run the program, go to the start menu and double-click on the Module Creator icon. The creator program consists of five screens which you can navigate by clicking BACK or NEXT on the program itself. Remember the path of where the module was saved. Do not run this on your local computer. If you execute (double-click) the module on your local computer, it will record the activity of that computer. You would then need to uninstall the software through the control panel before deploying to the remote computer. After creating the module, you need to install it onto the remote computer you are going to be monitoring. The most common method for deployment is through emailing with an attachment to your remote computer. 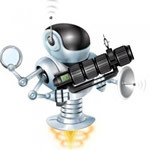 After deployment of SniperSpy on the remote computer, you should wait some time until the remote user reads their email and runs the program. This can be minutes or hours. Once the module runs on the remote computer, its activities will available for monitoring in your account within 15-30 minutes. You can log into your account anytime to check for results. For more information about the installation, visit www.sniperspy.com/guide.html. With the internet popularity & trend rising all around the world, more and more kids are getting in touch with computers. Huge numbers of kids are using the internet to surf web pages, chat, connect with friends and participate in online forums. Many illegal web sites and predators look for innocent, weak and inexperienced children as their prey. Parents often have no idea whether their kids are spending hours playing games online or if they are chatting with predators in chat rooms. To learn how to identify whether kids are in contact with a predator or not, parents can setup remote computer monitoring software such as SniperSpy to expose the truth. SniperSpy is a robust, full-featured computer spy software that lets you monitor your child’s online activity from anywhere using your PC or phone. Activities including all keystrokes typed, screenshots, websites visited, chatting conversations, applications executed, files and folders changed, and more. All of the activities recorded are uploaded to a private online account. You can login anytime from any computer to view results without needing to visit the remote computer. 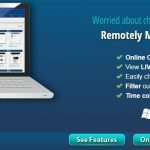 It’s perfect remote computer monitoring software for kids computer and internet activity.